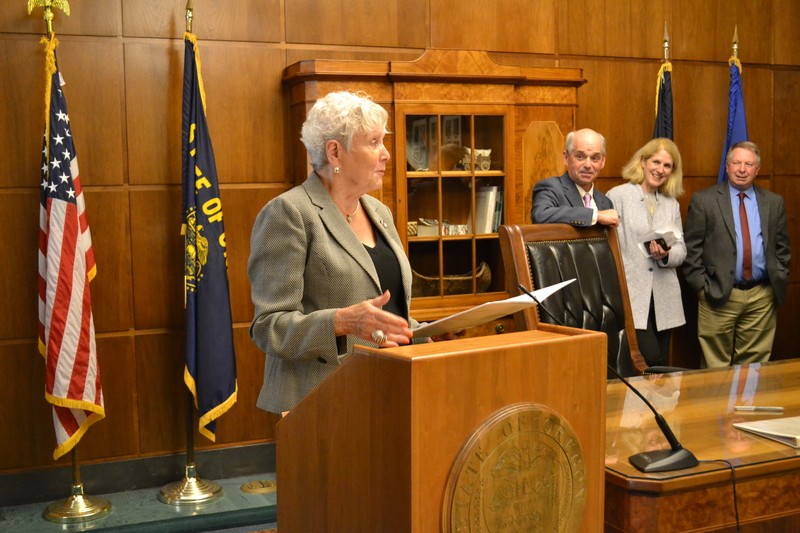 Bev Clarno, Oregon's new Secretary of State, is transitioning into the new role. She said she wants to honor the late Dennis Richardson's approach to the job, but it's too early to detail a specific policy agenda. Scores of family, friends, lawmakers and journalists packed into the Governor’s ceremonial office to watch Oregon’s newest Secretary of State, Bev Clarno, take the oath of office. The event was largely symbolic. Clarno was officially sworn in Sunday night, and got to work Monday morning. Clarno, an 83-year-old Redmond Republican, was appointed by Gov. Kate Brown to fill the remainder of Dennis Richardson’s term. Richardson died in office in February. Clarno previously served in the legislature as Speaker of the house in the 1990s and Senate Republican Leader in 2003, when there was an even 15-15 split in the chamber. Her former colleagues and friends, like Brown and senators Jackie Winters, R-Salem, and Betsy Johnson, D-Scappoose, talked about Clarno’s toughness. Clarno thanked Brown for the appointment and said how honored she was, but did not discuss a policy agenda or take questions from the media. In a later interview with Salem Reporter, Clarno said it’s too early to lay out an agenda for her 21 months in office. She said she wants to continue Richardson’s approach to the job by providing transparency and government accountability. She said she plans to keep the division heads on board and learn from the office’s staff. However, she will have to fill three executive positions. One of Clarno’s first moves Monday morning was to ask for the resignation of Richardson’s executive staff, comprised of his deputy Leslie Cummings, his chief of staff Deb Royal and Steve Elzinga, his government affairs director. “I wanted to just build my own leadership team, which has no reflection at all on their abilities and what they did here for Secretary Richardson,” she said. Clarno said she doesn’t yet have people in mind to fill those positions. Meantime, Clarno has a trusted team helping her with the transition. Nike Senior Director of Global Operations Julia Brim-Edwards, Clarno’s son Randy Hilderbrand and Kerry Tymchuk, executive director of the Oregon Historical Society, are helping her run the office. Hilderbrand and Brim-Edwards worked for Clarno when she served in the legislature. Clarno said as of now, she doesn’t plan to hire any of the volunteers on long-term. Clarno said going forward, she wants it known she plans to serve on behalf of all Oregonians, and specifically said she wants to be a voice for rural Oregon. She plans to bring her experience in farming and ranching to the State Land Board, a triumvirate comprised of Clarno, Brown and Treasurer Tobias Read which makes decisions on state lands. Clarno said she doesn’t have any ideas of how to use that influence yet, including on high-profile issues like the Elliott State Forest, but she wants to express the concerns of rural Oregonians. ﻿Reporter Aubrey Wieber: aubrey@salemreporter.com or 503-575-1251. The Salem-Keizer School District is home to more schools with high levels of impoverished students than any in the state. This in-depth series probes how educators are working to improve their education and catch them up with their peers. Across Oregon, emergency rooms are serving as mental health institutions, straining the system. Across Oregon, students in high-poverty elementary schools struggle where a majority of students are not native English speakers. Salem-Keizer has 13 such schools - more than any other district in the state.